The Rock of Gibraltar is famous worldwide. Situated in the southernmost spot of Europe, it is located in a strategic position, overlooking the Straits of Gibraltar, the Mediterranean Sea, the Atlantic Ocean and the Moroccan coastline. Although Gibraltar is imposing, it actually measures less than six square kilometres in total. 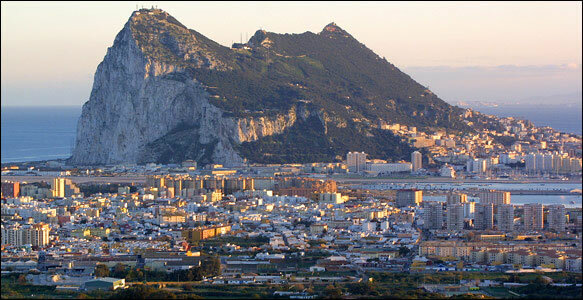 The inhabitants of Gibraltar are made up of Gibraltarians, British, Moroccans, Indians and Spanish. Visitors coming to Gibraltar are generally "one day tripper" and Spaniards who mostly spend the summer in nearby resorts along the Costa del Sol and Costa de la Luz and are attracted by the fact of entering a British place, seeing red booths and people speaking English and as well buying a carton of tobacco and some duty free alcohol. Gibraltar has its own airport with regular flights from the UK operated from British Airways, Monarch Airlines and Easy Jet. Recently the offer has been increased with flights from Madrid, operated by Andalus airlines. Other access options are via Malaga Airport and Jerez Airport, which can be easily reached by car (rent a car at Malaga airport) in about 90 minutes. Gibraltar harbor has a cruise ship terminal which is situated about 1 mile from the city centre. There are as well available ferries to Tangiers (Morocco), although there is a far greater offer of regular ferries to the African coast from the neighbor city of Algeciras, which is situated only 20 minutes away. Gibraltar is connected with Spain by a narrow land strip. The Spanish border town La Linea is very well connected by bus with the main resorts along the Costa del Sol and westwards to Cadiz and the Costa de la Luz. The La Linea bus station is only 5 minutes a walking from the border. When driving with your car hire, make sure that it is insured to cross into Gibraltar. As La Linea is just opposite the road, you can also park near the frontier and walk across. You might consider if it is absolutely necessary to enter Gibraltar by car. The Rock has 29,000 inhabitants and 23,000 registered cars and given how small it is, there is very little parking, which is almost always full. Remember that you will need your valid passport to cross the frontier in both directions. The border between Gibraltar and Spain is continuously open for vehicles and pedestrians. If you travel to Gibraltar by car, you take the N-340 / A-7and turn off at San Roque for La Linea, the Spanish border town. You will find the route to the border well signposted. A great inconvenience might be the long queues of vehicles during peak times wishing to go onto and leave the Rock. In that case, it is a good option to leave the car (car hire Malaga) in La Linea and walk across the border. If you cross the frontier by car, watch out, there is a rigorously monitored queue. Don´t try to outsmart the locals and jump the queue (remember we told you to park in La Linea): Nearly everybody has the number of the Guardia Civil Police and informs of your car´s registration number and once you reach the frontier, you will have to turn back again. Other means of transport from the Spanish mainland are daily bus services from Malaga and the main resorts along the Costa del Sol and Algeciras to La Linea. The bus station is only a five minutes’ walk from the border. Many tour operators offer as well day trips and transfers from Malaga to Gibraltar and from many Costa del Sol resorts. To be able to cross the border, you need a full valid passport or EU identity card; non-EU citizens might need a visa to enter Gibraltar. Further information is available at csro@gibraltar.gov.gi or info@gibraltar-airport.com . Once crossing the border there is a large plain, which is nothing else than the Gibraltarian airport runway. Don´t be surprised to see red lights and find the barriers closed; some flight lands or takes off and you will have to wait until the plain is used again as road. From the border it is a 20 minutes’ walk crossing the runway of Gibraltar airport. Right after the border there are several bus stops, a taxi rank and a Tourist information office. There are several options of getting around the rock, which is literally possible, as there is one ring road in Gibraltar and the place is quite small (about 6 square kilometres). If you have enough time, you can even do it on foot; as for instance walking to the lookout point of the cable car would be a two hours walk. You can also move around by bus, which run in the main part of the Rock, apart from the Upper Rock, which is a natural reserve. Gibraltar Taxis offer as well tours and are available at the frontier and throughout the city. Another option for getting around town is hiring a bike; information is available at the Tourist information office at Casemates Square. The cable car is one of the mayor attractions of the Rock and will not only give you access to spectacular views but as well to the attractions of the Upper Rock. The cable car opens from 9.30 to 19.15 h, 7 days a week. You can reach the Upper Rock on a narrow winding road, on foot (about 2 hours), by car, with the cable car or with an organized tour. From there you can enjoy impressive views of North Africa, the Atlantic and Mediterranean Sea. St. Michael’s cave is a natural cavern which is also used as a venue for concerts as it forms a magnificent auditorium. The sieges in the late 18th century led to the excavation of a tunnel network in the rock, covering about 32 miles. Some sections of these Great Siege Tunnels are open to the public. Gibraltar boosts as well a botanical garden, which was inaugurated in 1816. A great thing to do is getting on a boat and watch Dolphins, as the bay of Gibraltar is the permanent habitat to three different types of Dolphins. In Gibraltar there are many places to enjoy an evening out. Some visitors might opt for Hotel cocktail bars, but there are as well many wine bars and pubs in town and so there are discos and even a Casino. During the summer months can be found live entertainment around Casemates Square. In the tourist board is available an up to date Events calendar. Commonwealth day - Monday 8th March, Good Friday - Friday 2nd April, Easter Monday - Monday 5th April, May Day - Monday 3rd May, Spring Bank Holiday - Monday 31st May, Queen's Birthday - Monday 14th June, Late Summer Bank Holiday - Monday 30th August, Gibraltar National Day - Friday 10th September, Christmas Day - Monday 27th December - Tuesday 28th December and New Years day – Saturday 1st January 2011. Do not wonder about the way of talking of the locals (called Yanitos), a curious mixture of English and Spanish, which combines words of both languages (i.e. “Vamos al beach”= “Let´s go to the beach”). When it comes to paying your bills, another mixture: You can pay in Euro and Pound Sterling. Euros are accepted everywhere, but you do not always get change in Euros but Pounds. There is a wide range of offers for shopping in Gibraltar and if you opt for buying larger quantities of alcohol and Tobacco, it would be advisable to check beforehand what you can bring across the border. (Only allowed to get through customs tax-free one carton and one bottle per person). Especially recommendable are articles like perfumery and cosmetics, chocolate, Hindi food stuff and fuel for the car. All prices are indicated in pounds. A Gibraltarian Pound has the same value than a Pound Sterling. A fast conversion method to Euros is the amount, plus half (i.e. 15 GBP=22, 5 Euro). As a final recommendation from our Spanish editor, prices for food are generally high in Gibraltar; reserve your appetite for Spain and enjoy some tasty tapas (snacks) in the border town of La Linea.